This is a shallow venue on the edge of the New Forest National Park and situated at the mouth of Southampton Water. It usually comes on song during the last three hours of the fl ood tide and the first couple of hours of the ebb. It is a sheltered south-east facing shingle beach and makes a good back-up venue during a southwesterly blow. Night sessions are recommended. Weed can be troublesome when the tide is ebbing. Plenty of small black bream to rattle the rod tip by day, but as darkness falls expect silver eels, bass, pouting and some small smoothhounds. Other species such as Dover soles, plaice, flounders and dogfish will appear. Peeler crabs will take the smoothhounds, eels, bass and pouting. A small ragworm tipped with a sliver of squid works for bream, while ragworms will also account for many species found here. During the day it can pay to cast at distance for black bream, but keep your hooklengths light along with a size 4 short-shank hook. Other species will run fairly close to the shore in darkness, so a 40-yard lob is more than adequate. You do get the occasional doublefi gure hound, so set the clutch on your reel. Some good bass are taken along this stretch, but there is often too much weed for plugging. They do take a freelined bait fished right in the gutter. Leave the M27 at junction 2 heading south towards Totton and then follow the signs for Fawley on the A326. As you pass Fawley oil refinery take the B3053 which leads directly to Calshot. There are several pay and display parks and pay and display roadside parking. Some free parking is available near the access point close to the best fishing at the eastern end of the venue just past the beach huts. Directions : Leave the M27 at Junction 2 heading south towards Totton and then follow the signs for Fawley on the A326. As you pass Fawley oil refinery take the B3053 which leads directly to Calshot. Gas Works and White Mark. Minehead. It is thought that the Romans landed at Reculver in AD43, but the existing fort was built in the 3rd century while the two towers were rebuilt in the 12th Century style. During World War II the Bouncing Bomb was tested at Reculver and there are traces of the test site and some deep indentations. There is a public house, cafe, car park and toilets making Reculver a comfortable fishing mark for anglers of varying experience. Large bolders have been introduced along the sea wall to aid sea defences. The Apron, which is in front of the towers, has always been an excellent mark for bass. The sea bed here is predominantly clay, sand and mussel beds, but further to the right of the towers is a shingle beach with small groynes about 50 yards apart. Further right is Coldharbour Sluice, which is good for smoothhounds and rays, particularly on an evening tide when the sea is calm. A good time to fish for codling is three hours after high tide. Weed can present a problem at times. Whiting and maybe codling likely during the winter. Thornback rays, bass and smoothounds are the visitors during the warmer months. Lugworms tipped with mackerel for whiting. Peeler crabs will catch bass and smoothhounds. Frozen sandeels, such as the Ammo green packet version, are good for the thornback rays. A standard 12-13ft beachcasting rod with a multiplier or fixed-spool reel is required. Use a two-hook flapper rig for whiting and cast out between 60 to 80 yards. The best rigs to use for smoothhounds and rays are a fixed paternoster or a pulley rig baited with either a whole peeler crab or a sandeel, then cast it about 80 to 100 yards. Reculver is three miles east of Herne Bay off the A299 Thanet Way. To contact Reculver Country Park, Military Rd, Canterbury, tel: 01227 74067. Ron Edwards Fishing Tackle, 52 High St, Herne Bay, tel: 01227 372517. Opening times: Monday-Wednesday 7.30am-5.30pm, Tuesday & Saturday 7.30am-noon, Sunday 7am-noon. Bait: Fresh lug and rag, plus frozen bait. A sandy beach offering quite deep water close inshore, especially at the southern end where it forms a point with the beginning of Great Yarmouth's north beach. There is a similar point opposite the lifeboat shed and both areas have strong tides and some snags, mainly due to lost tackle. A granite sea defence system has been constructed at the northern end. The beach can be good on the flood and ebb tide, but the last two hours of the ebb and low water are often best. Deep water means the beach can be fished when the sea is rough, although weed is a problem. A cod beach due to its strong tides. November and December are the peak months for big fish, with smaller codling in March and April. Whiting are caught from September to December, with dabs from September to January. Some bass from May to September, especially around the sea defences. Lugworms best for cod, although hooking a whiting and leaving it out as a livebait can take big fish. Lug, fish or squid cocktails are good for whiting. Lug tipped with sprat gets big dabs in January. Lures work from the sea defences in summer when the water is clear. Strong tides may require the use of a 175g lead weight. Landing big fish or pulling from snags is safer with 18lb mainline, but you can use 15lb mainline and a 50lb shockleader most of the time. Distance casting is not usually essential, so a reasonable surf rod and reel are adequate. Rigs without clips (flappers) work well. Located just north of Great Yarmouth on the A149 with roads into the town at each end and in the middle of the bypass. From the town Braddock Road, Second Avenue and Tan Lane take you to the beach. Atherfi eld is on the south-west of the island and provides easy access to deep water and a varied sea bed. The middle section of the beach offers generally clean ground, the ground to the west is rougher and deeper while it is very rocky at the eastern end, known as Atherfield ledge. Ballan wrasse are caught from Atherfield ledge, congers on the rougher ground and rays from cleaner sections. Painted rays are the most common, but others also put in an appearance. Bass, pouting and dogfish are taken. Use fresh mackerel and pouting for congers. A sandeel, alone or with a squid wrap, gets rays. Ragworms and crabs for wrasse. Bass take most baits. A surfcasting outfit suitable for mixed ground should be used. A 5-6oz wired lead is fine in most conditions though 8oz will be required if the swell is heavy. Distance casting with a clippeddown pulley rig with hooks around size 4/0 catches wrasse. Other species can be caught closer to the beach. Bass are often in the breaking surf. Atherfi eld ledge offers scope for the plug and lure angler. Shepherd's Chine offers the easiest access. This is located at the western side of the Atherfield holiday camp on Military Road (A3055). Car parking is on the grass verge. 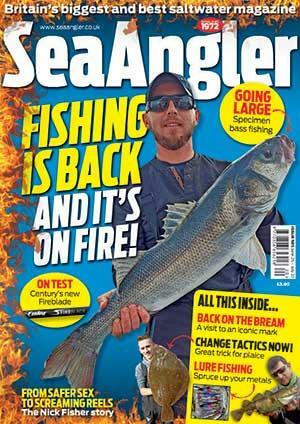 Angells Angling Centre, 7 Yarborough Mews Arcade, Shanklin, tel: 07890 160336. Opening times: 9am-5pm Monday to Saturday. Bait: Fresh ragworms and a selection of frozen bait. Barney's Bait Supplies, 2 Bridge Rd, Cowes, tel: 01983 280704 or 07880 674484. Opening times: 8am-10pm every day. Pryde of Cowes, 12 Birmingham Rd, Cowes, tel: 01983 299211. Opening times: 5am-5pm Monday to Saturday, 6am-1pm Sunday. Stuart's Bait and Tackle Centre, Shanklin, tel: 01983 868100. Opening times: 9.30am-6pm Monday to Saturday, 9.30am-12.30pm Sunday. Tackle Box, The Avenue, Freshwater, tel: 01983 752260. Opening times: 10am-6pm Monday to Saturday, 10am-1pm Sunday. Bait: Fresh local bait and frozen bait always available. Scotties Tackle, 11 Ludley St, Newport,, tel 01983 522115 and 22 Fitzroy St, Sandown, tel: 01983 404555. Opening times: 9am-5.30pm Monday to Saturday, 9am-noon Sunday. Bait: Fresh ragworms and peeler crabs in season and a selection of frozen bait. Union Sports Isle of Wight Angling Centre, 2 Union St, Ryde, tel: 01983 616636 & 3 High St, Sandown, tel: 01983 406639. Opening times: Ryde, 9am-5.30pm Monday to Saturday, 10am-2pm, Sunday; Sandown, 9am-5pm Monday to Saturday. Bait: Large selection of fresh and frozen bait, including peeler crabs. This area fishes best between May and September for most species, with the peak fishing during the height of the summer. Fish around the low water period and back up the tide, but try to avoid the first few days after a heavy period of rain because the amount of fresh water coming down the river has a negative impact on the fishing. Marks around the quarry are best for flounder and eels with an occasional bass. Beware of the underfoot conditions at some spots because it is quite muddy, but fishing from the quarry area provides flat rocky stances and easy access. Further down towards the caravan park at Auchenlarie, the ground is made up of boulder beaches running into the sandy channel. Most of the smoothhound and tope are taken here. Watch out for the occasional better tope, which can go to 40lb-plus. Smoothhound are on the small side, but fish to 6lb are not uncommon. Occasional 8lb plus bass and some flounder to 2lb+ and eels can be caught. Bass, smoothhound, dogfish, tope, flounder, dab, eel, cod and gurnard. Top bait will be fresh peeler crabs, although frozen can work quite well. Lugworms are a good second choice with other useful baits being sandeels, launce and mackerel for tope. The bottom is made up of sand and mud, so fairly light tackle can be used when targeting bass and smoothhound. Standard multipliers and fixed-spool reels loaded with 15-18lb line are fine. Beachcasters do not need to be too heavy, except for tope. When fishing for tope, ensure your reel has at least 200 yards of line. Tope hooks should be size 6/0 and it is advisable to use a wire biting piece or 250lb mono fished on a running leger or pulley rig. All other species can be caught on a paternoster rig with size 1/0 -4/0 hooks. Take the A75 from Stranraer to Dumfries. The venue is between Creetown and Gatehouse of Fleet. Parking is at the side of the road and then it is a matter of on foot down to the waterside. Care needs to be taken when walking down the paths as they can become very slippery when wet. Galloway Angling Centre, 87 Queen St, Newton Stewart, tel: 01671 401333. The Sports Shop, George Street, Stranraer, tel: 01776 702705. Cowes seafront offers some of the easiest access to deep water on the Isle of Wight. Parking on the front is within 20 yards of the sea at high tide. A short cast of 60 yards will put your bait in deep, sometimes swift-fl owing, water. It is probably best to avoid this venue during large spring ebb tides when weed can make fi shing impossible. This is a very popular destination for tourists, which may make daytime fi shing impractical in summer. Pouting all year round, but most anglers will either be after Dover soles in the summer and autumn or bass from spring to autumn. Cod can be taken in winter, but are not plentiful. In summer, mackerel are taken on feathers and bass on plugs. Ragworms catch soles and bass. Crab baits are more effective for bass and sometimes smoothhounds. Large squid and lug baits offer the best chance of a cod. Long casting is unnecessary and can often be a disadvantage. Due to the sometimes heavy tidal fl ow, a rod capable of casting up to 8oz may be required. Paternoster rigs with hooks of size 2/0-4/0 are needed for bass or cod, but use size 2-4 hooks for soles. Use spinning gear when lure fi shing. The Isle of Wight is easily reached. Closest ferry to Cowes is the Red Funnel service, which docks in East Cowes (car ferry) or Cowes (passenger service). Once in Cowes, follow the signs to the sea front, which may be referred to as Egypt Point. If arriving on the Wightlink ferries from either Fishbourne or Yarmouth, follow the road signs to Newport (A3054), then on to Cowes (A3020). Isle of Wight Tourism, tel: 01983 813800. Web: www.islandbreaks.co.uk. Barney's Bait Supplies, 2 Bridge Rd, West Cowes, tel: 01983 280704 or 07880 674484. Scotties, 11 Lugley St, Newport, tel: 01983 522115. The Tackle Box, The Broadway, Totland, tel: 01983 752260. This is a great spot for the sea angler visiting the Isle of Wight because there is a car park 50 yards from the beach. The extreme eastern and western ends of the small bay are fished from the beach, while the centre can be fished from the promenade over high tide or from the beach when the tide is lower. The bay offers deep water at high tide, fishing over broken ground. Pouting, wrasse and eels, especially in calm weather. Good bass fishing at first light or late evening when rough in a southwesterly blow. Whole squid, mackerel head or large crab baits for bass. Worms and smaller fish baits for other species. Plugs or Delta eels will suit the lure angler. Standard 4-6oz beach gear will suffice, though 20-25lb mainline is beneficial because there are some snags. In rough weather 8-10oz weights will be needed, though long casting is unnecessary. Spinning gear and 8-10lb line is best for lure fishing. Flowing traces, paternosters or pulley rigs work with hook sizes to match bait. Freshwater Bay is at the western end of the island, directly south of Yarmouth. Closest ferry is the Wightlink Lymington to Yarmouth service. Eype is an interesting sea fishing mark on Dorset's western fringe, which offers a good variety of species from May through to the end of the year. The section in front of the access point offers fairly clean ground, but as you go west the ground becomes increasingly snaggy with some tackle losses expected. Best action is reserved for a night flood tide, especially just after a blow but during the summer some species, such as mackerel and wrasse, will be in bright, clear daylight conditions. Rays start to figure during May, followed by some very good bass from June onwards. During the summer expect wrasse, mackerel, scad and silver eels, but as autumn approaches the venue becomes alive with dogfish, bass, bull huss, big pouting, silver eels and some decent conger eels. Worm baits will pick up smaller species, such as eels, pouting and wrasse, but switch to peeler crabs for the bigger wrasse. This is a big fish venue with both large mackerel and squid baits picking up the better predators. Use a fairly robust rod and reel. A rotten-bottom system is also advisable, especially towards the western end of the beach. Large freelined baits fished in the gutter under the cover of darkness can prove deadly for the bigger bass, but keep light and noise to a minimum. Stick to a one or two-hook trace, even for the smaller species because more hooks mean more snags. During the summer you can feather for mackerel or float fish for garfish and pollack. Directions : Follow the A35 Bridport bypass west for half a mile. At the top of the fi rst long hill take a left into a service area and then follow a minor road for a mile to Eype. There is a small cliff top car park; during the winter months. A large rock groyne marks the boundary between Princes Parade, Seabrook, and Marine Parade, Hythe. It is at the end of Twiss Road, opposite the Imperial Hotel, and is known as Twiss Groyne. A favoured draw on this popular competition venue is the high side of the groyne on the western side (facing the sea). A steep and fairly deep beach, it produces fish all year. The groyne is a main feature and is rarely without anglers. The tide is medium and runs west to east at high tide. Beware of casting close to the groyne marker at the end because the tide will sweep your line around it. The groyne is a handy low tide access point when plugging for bass in summer. High tide is the favoured time for bottom fishing for dabs, flounders, soles, bass, plaice, whiting, pouting and rockling, with the odd codling showing through autumn and winter. During summer there are mackerel in daylight, with pouting and the odd bass or soles after dark. The spring tides are always most productive, especially during or after a southwesterly gale. Black or common lugworms are favoured in winter, especially tipped with a piece of squid, clam, fish or white rag. Razorfish and clams can sometimes be deadly after a storm in the New Year. A live pout or whole Calamari squid fished close to the groyne after dark tempts bass. Feathers are used for the mackerel in summer. In clear water it's the spot to fish a float for scad, garfish and the odd big mullet in summer. Small whiting returned near the groyne often attract bass in autumn, so keep an eye on the surface. Long-range casting is best during autumn and winter, although a large bait fished close often accounts for a bass. In late winter scratching for rockling and flounders close in on the eastern side of the groyne wins a lot of the matches. Best is a three-hook clipped rig for range or a flapper with size 2 hooks and standard beachcaster, casting a 5oz breakout lead weight. Head for Hythe on the M20 off junction 11. Take the A259 east out of Hythe towards Folkestone, then the first right after the roundabout at the east end of Hythe town centre, that's Twiss Road. A car park close to the big groyne can take 20-plus vehicles. Bait: Black lug, frozen bait and Gulp artificial.